Oval Double Halo Round Diamond Engagement Ring with Pave Setting | Shane Co.
Seventy-two round diamonds, at approximately .61 carat total weight line the split shank sides and top of this magnificent oval double halo engagement ring crafted from quality 14 karat white gold. 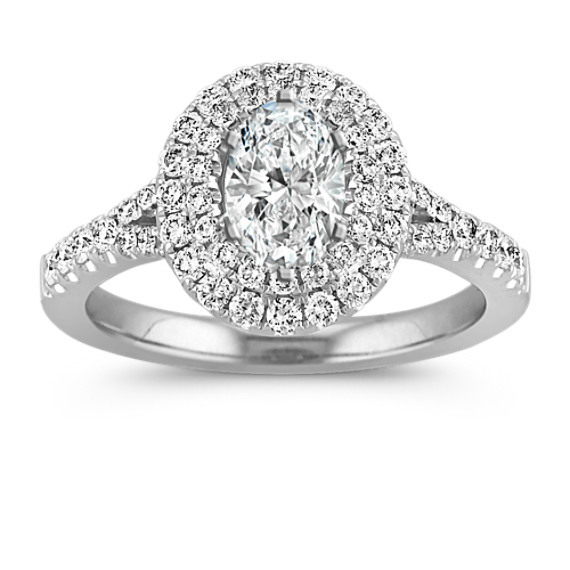 The center oval gemstone of your choice at approximately .75 carat will look divine in this brilliant pavé setting. Please contact a customer service representative for additional information or questions regarding your center stone selection. Gorgeous ring with a ton of sparkle!